Long-time opponents of Social Security spun wild yarns about the debt and deficit this summer, and during the run-up to the so-called “fiscal cliff”. Ignoring ten years of war and tax cuts for the wealthy (both purchased on the national credit card), as well as a pandemic of Wall Street greed that nearly sunk the American economy, they pointed their finger at America’s last stronghold of economic safety: Social Security. Now, one well-known economist has had enough – and he’s visiting Washington state to talk about how to defend and improve Social Security for future generations. 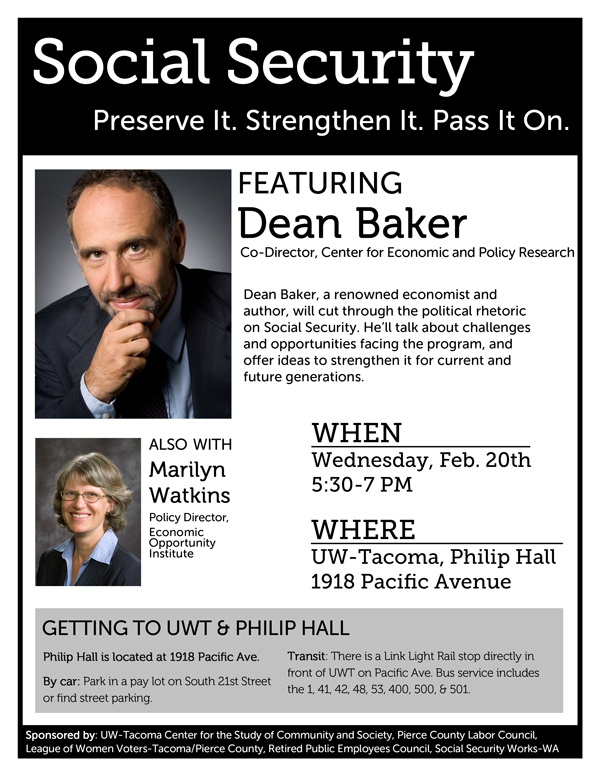 Please join us at a forum to hear economist Dean Baker talk about the challenges and opportunities facing our Social Security system, on February 20 from 5:30 – 7:00 PM at the University of Washington-Tacoma’s Philip Hall, at 1918 Pacific Avenue. Dean Baker, Co-Director of the Center for Economic and Policy Research in Washington, D.C. will explain that Social Security is on sound financial footing, and show how a few tweaks can keep it strong for future generations. He refutes the misguided notions that the benefits workers have earned should be used to pay down the debt or finance ongoing tax cuts for the wealthy – or that the retirement age should be raised any further. Instead, Dean makes a strong case for increasing benefits, especially given the uncertainty most Americans are facing in retirement. Marilyn Watkins, Policy Director at the Economic Opportunity Institute, will also be a featured speaker. Contact us for more information.